Ageing is an inevitable part of life. And the older you become, the more you are likely to feel a decline in your overall vitality. One reason for this is the gradual degeneration of the veins and capillaries in your vascular system. This leads to wrinkles, loss of sight, sore muscles, swollen feet, and tired legs. At MASQUELIER’s® we don’t believe in eternal youth, but we do believe there are solid and specific steps you can take to preserve your vitality. 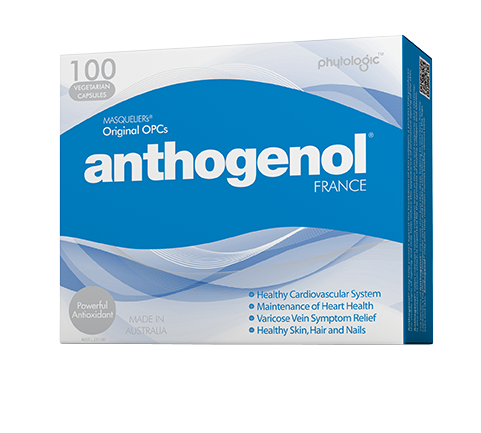 Of course, there is no single answer, but when you take Anthogenol® you are taking one step towards a healthier and more active life as you age. One of the keys to healthy ageing is effective microcirculation. For your eyes, legs, skin and organs to function optimally, it is vital that your blood delivers the essential nutrients and protects your blood vessels against free radical damage. A well-functioning vascular system is as crucial as it is beneficial – and Anthogenol® supports just that. FOUR Provides nutritional support for the health of the heart and cardiovascular system. Take one capsule per day before a meal to assist general health. For eye and heart health, take one capsule two to three times daily before meals. For varicose veins take one capsule three times daily before meals. If symptoms persist, see a healthcare professional. If fluid retention persists, seek medical advice. The best moment to take MASQUELIER’s® Anthogenol® capsules is 30 minutes before a meal, or between meals, with a large glass of water or juice. Taking the capsules with a meal will not have an adverse effect on the efficacy of the product provided you don’t take the capsules with milk, yogurt or other protein drinks or food. Store below 25°C. Do not use if blister seal is broken or missing. Anthogenol® cannot be compared with other Vitis vinifera (Grape Seed) products or supplements, due to the highly specialised, proprietary extraction process. Vitamins can only be of assistance if the dietary vitamin intake is inadequate. No added wheat, gluten, yeast, animal products, milk derivatives, salt, lactose, sugar, artificial colours, flavours or preservatives. Suitable for vegans/vegetarians.